Assay accuracy is defined as the degree of closeness of achieved results relative to their actual (true) values. International standards exist for total IgG, IgA and IgM (CRM 470 and DA470k) . Therefore, these standards were used to assign values to HLC assay reference materials to ensure accurate results. An overview of the process of calibrator assignment for HLC assays is described below, using the IgA assays as an example. 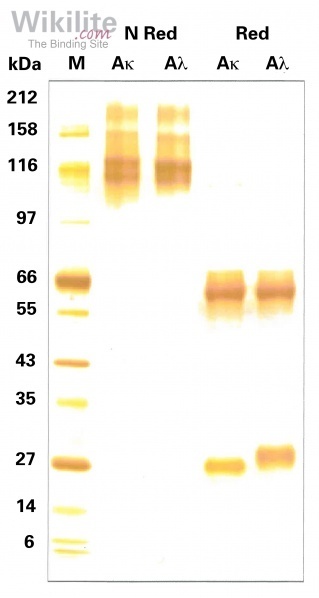 For IgA HLC assays, polyclonal IgA was purified from pooled normal human sera by ammonium-sulfate precipitation, anion-exchange chromatography, and immunoaffinity chromatography. 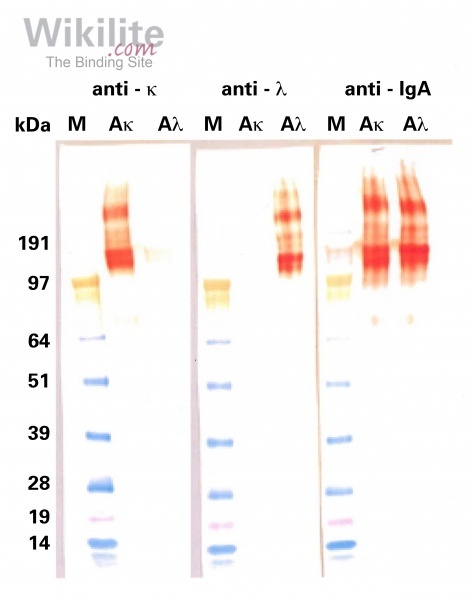 Low-level contamination with alternate classes of immunoglobulins was removed by immunoaffinity adsorption and/or protein G affinity chromatography. Fractionation of κ from λ light chain forms was achieved using both protein L and anti–light chain immunoaffinity matrices. ). 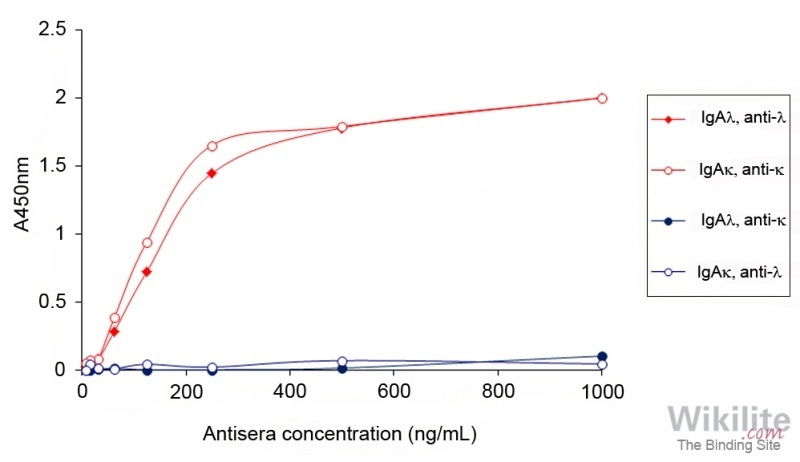 Similar methods were used for the calibration of the IgG and IgM HLC assays. During validation, a detailed comparison study is performed for each assay: summated concentrations of HLC immunoglobulin pairs (e.g. 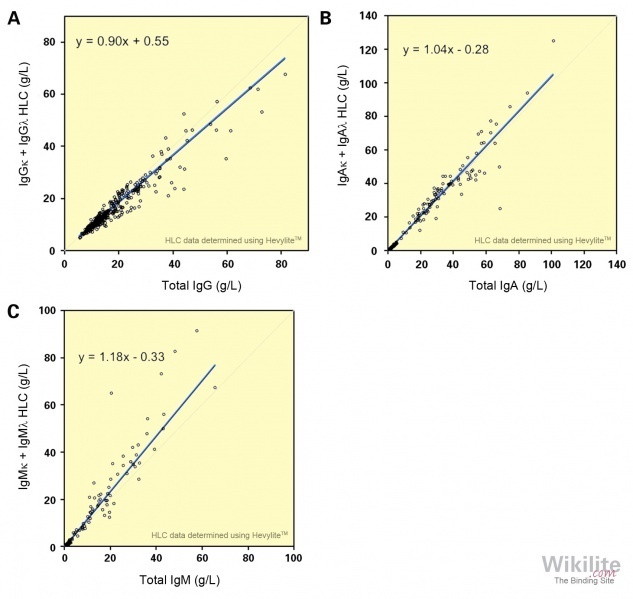 IgAκ + IgAλ) are compared with total immunoglobulin measurements (e.g. IgA) as a test of assay accuracy. All specificities demonstrate a high degree of correlation, and the results are summarised in each product insert. An example is shown in Figure 9.9.